I've recently watched two movies in the cinema. 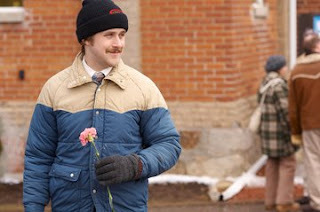 First, I saw Lars and the Real Girl which stars Ryan Gosling as a socially isolated guy who falls in love with a doll he orders on the internet. Not the most believable movie but supremely entertaining and interesting. Ryan Gosling is incredible as the main character and totally weighs up the incredibility of the movie. It's a very nice story which brings up some interesting thoughts. The other movie was lacking in entertainment but providing in showing detailed anatomy of Marisa Tomei. This was a rather unpleasant film to watch because the characters were so sad and well, stupid. You didn't root for anybody and therefore I just felt I was watching a movie that wasn't very interesting. I've never liked these heist movies. They are usually all alike, where there is a heist and then everything goes haywire. That certainly happens in this film but you don't really care. Crime doesn't pay? I knew that. I had a pretty funny incident today as well. Went to the health shop and did some shopping. The girl who works there is very nice and we usually start a conversation. Today was no exception and we talked about bananas and muffins (of course). However, the conversation seems to have distracted us as I walked out of the store with the groceris without paying. When I came home and started unloading I had the sudden thought that I didn't remember paying her for the groceries. OOps. Well, anyway I ran over there and paid her. The funny thing is she didn'e even notice herself! She was pretty impressed by the honesty of me coming back. Crime doesn't pay, hey. This entry was posted on fimmtudagur, apríl 17, 2008 at 4:39 f.h.. | You can skip to the end and leave a response.